The tankless technology of Nordson ProBlue® Liberty™ melters, along with the new multi-feed adhesive container, helps packagers reduce waste, char, downtime and energy consumption across multiple lines. Nordson Corporation (Nasdaq:NDSN) announces the global* release of the new ProBlue Liberty, an integrated tankless melter and multi-hose fill system that allows packagers to reduce waste, char, downtime and energy consumption on their production lines. 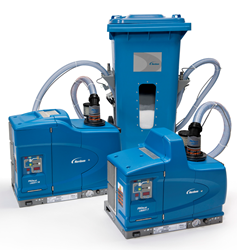 The new system incorporates the latest Nordson tankless technology—originally introduced in our Freedom™ system—into the ProBlue® series of melters that service more than 100,000 hot melt packaging applications worldwide. A proprietary sensor monitors molten adhesive levels in a small hopper and alerts the fill system to add the appropriate amount of hot melt. By melting only what is needed and when it is needed, the ProBlue® Liberty™ melter virtually eliminates char buildup. The new multi-hose adhesive fill system is flexible, based on the application and can feed from one to four melters helping packagers reduce adhesive waste caused by manual filling. The ProBlue Liberty tankless system is compatible with all Nordson Blue Series hoses and applicators, will process any free-flowing hot melt, and can be easily interchanged with existing Nordson melters. For more information on ProBlue Liberty contact Nordson Corporation in the U.S.at (800) 683-2314 or in Germany at 49.211.9205.0. Visit http://www.nordson.com/hotmelt for other locations and more information. Nordson engineers, manufactures and markets differentiated products and systems used for dispensing and processing adhesives, coatings, plastics, sealants and biomaterials, with related technologies for managing fluids, testing and inspecting for quality, and treating surfaces and curing. These products are supported with extensive application expertise and direct global sales and service. The company serves a wide variety of consumer non-durable, durable and technology end markets including packaging, nonwovens, electronics, medical, appliances, energy, transportation, construction, and general product assembly and finishing. Founded in 1954 and headquartered in Westlake, Ohio, the company has operations and support offices in more than 30 countries. Visit Nordson on the web at http://www.nordson.com, http://www.facebook.com/nordson, or @Nordson_Corp. *ProBlue Liberty is available in all countries except Australia.